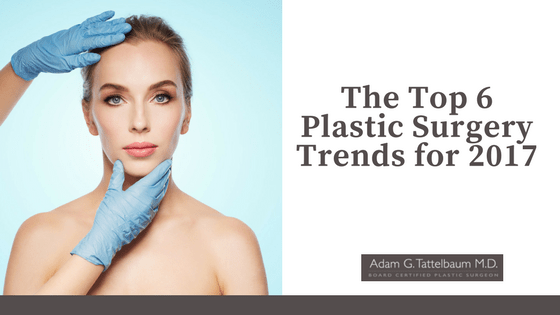 Top 6 2017 Plastic Surgery Procedure Trends - Adam G. Tattlebaum M.D. 2017 has been a big year for plastic surgery so far. It is not over yet. There were more than 17 million procedures performed in 2016. When the numbers are compiled for this year, we may very well see an increase. As Maryland plastic surgeons, we have seen quite a lot. Check out our list of the top 6 plastic surgery procedures below. Perhaps it is a bit paradoxical, but it is true: often the happiest cosmetic surgery patients are those who have breast augmentations, and breast reductions. Having large breasts is a blessing for some, and a burden for others. Often, women struggle with the decision to get breast reduction surgery. Many work up the courage for years before they even get a consultation. Breasts can be quite heavy, and in many cases breast reduction surgery may decrease shoulder and back pain. Many women are electing to have breast augmentation surgery, but it is of note that women are not electing to have breasts that are as large as they once were. The average size is something between a C and a D now. Only a scant few years ago, women were electing to have DD, or even E cups. Some surgeons are transferring fat from other areas of the body to enlarge the breasts. This remains controversial though, as the grafted fat can be confused for breast cancer. Many new mothers choose this procedure. Breast augmentation can help one’s chest return to its natural state, and bring back a lot of volume that is lost. Facelifts fell out of the top five most popular cosmetic procedures in 2015, but now they are back in force. One of the biggest positives about facelifts is that there are immediate results. Right away, people can start looking how they want to look. In this surgery, the surgeon removes excess skin and fat to create a more youthful appearance. In addition, this surgery softens deeper folds and jowl lines. One of the reasons that this is surging in popularity is because the number of older Americans has never been larger than it is right now. One of the biggest trends in cosmetic surgery today is the movement from front to back. People who pick this type of procedure are not looking for just size. One of the advantages of this surgery is that in the right patient it can make the buttocks shapelier, as well. Interestingly, the combination of a breast and abdominal enhancement continues to be a mainstay. Restoring a normal figure after child bearing will likely never lose favor. Making women feel normal again after pregnancy is one of the most popular things we see. This trend is here to stay. This is by far the most popular treatment that cosmetic surgeons provide. It is considered a walk-in, walk-out procedure. This means that it is minimally invasive, and takes a very short period of time. Appointments can be scheduled with minimal concern for recovery time. The most common side effect is bruising or swelling. Botox remains the most popular injectable. Dysport and Xeomin are quickly growing in popularity, but more people ask for Botox than any other alternatives. All of these products selectively weaken muscles, and can help people maintain a more youthful experience. If you have any questions about Botox in Maryland, contact us today. Adam Tattelbaum can be your plastic surgeon. He is a highly-qualified, experienced, and personable cosmetic surgeon in Virginia and Maryland.